Well, it has to be said, after our last week of strenuous activity - either in the form of long cycle rides or walks, we're both feeling a bit jaded and in need of a little 'holiday', so with that in mind, we decided to slow our pace over these 2 days. However, on Sunday chores had to be done - we needed to replenish supplies (which we did at the local Lidl) and move 'house' back onto The Ring of Kerry ready to start our exploration of the Iveragh Peninsula. However, we think we've made a bit of a blunder - in my previous blog I explained how ALL the tour busses travel around the Ring-O-Dingle in a clockwise direction to avoid any comings together - and we thought it would be the same on this peninsula - WRONG - here they go anti-clockwise! And guess which way we're going🔁 😂, but by the time we realised it was to late to change our plan! So all we can do now is keep our fingers crossed and hope we only meet the big buggers when there's room to pass! Anyway, after leaving Killarney we traversed along narrow roads that just about qualified as 2 lanes bumpy tracks, and in so doing we passed by more of The Reek Mountains where we spotted a 🦌 with it's Bambi and another sheep dog chasing sheep off the hillside. And very conveniently, at this point there was another mountain lake with a big pull in - so that provided a lovely coffee stop. Then once we were on route again it didn't take us long to get onto the Iveragh Peninsula where we passed through the pretty towns of Kenmore and Sneem which were very busy with tourists and coaches. However, our target was a little further on - it was the Wave Crest Caravan Park just outside the hamlet of Caherdaniel - a site that we just managed to catch while it was still offering the cheap ACSI rate of 19 euros. And we really couldn't have picked a better place to kick back and relax - it's motorhome heaven. The site is right on the water's edge just a very short distance from O'Carroll's Cove, and additionally it's pitches are scattered about randomly and we were lucky enough to bag a quite secluded one just metres from the water. How lucky were we? Needless to say we wasted no time at all in making our cuppa and putting our feet up for the rest of the afternoon before treating ourselves to a lovely Sunday Roast all cooked by yours truly in T4rdis2's little galley! And Monday - well it was a bit of a race to get out for a stroll (5 miles!) before the promised rain came. For our walk we decided to visit Lamb's head which is an almost deserted dead end rocky cul-de-sac with a tiny pier at it's end. This provided views over beaches that were the province of horse and riders, along with sights of unusual residences and lots of peace and tranquillity that assisted us in recharging our batteries. We made it home just before the rains came - and that was quite lucky - because since it started it's hammered down quite noisily on T4rdis2's roof - but we both agreed that if we were going to be kept 'prisoner' for the afternoon, our jail was in a spectacular place where we could watch the splashing lapping tides advances. Tuesday 27th June 2017 - Mostly overcast with occasional drizzle. Today's been another quiet one for us, and all we've really done is move a bit further around the Iveragh Peninsula to the Mannix Point Campsite near Cahersiveen where we plan to stay for the next 4 nights (the rate was 4 for the price of 3😂). However, to get here we had to drive over The Coomakista Pass which took us to it's summit at 700 feet, and luckily once we were up there we easily found a parking space where we could sit with our coffee while we soaked in the panoramic sea views over a small harbour, and more distantly to the islands of Deenish and Scariff. Then once we got going again we were soon in Waterville, apparently a town much favoured by Charlie Chaplin! The story boards say that he first arrived there in the late 1950s after the town had been recommended to him by his friend Walt Disney as a good place for fly fishing. After that the Chaplin family became regular visitors and a bronze statue was erected in Charlie's honour in 1998, and since 2011 there has been a Charlie Chaplin Comedy Film Festival held every summer! Waterville also looks out into Ballinskelligs Bay, which I'm sure on a good day would be beautiful, but today with low mist and mizzle chasing us we didn't pause long to admire it. We landed on the campsite, which claims to be the BEST IN IRELAND in time for lunch, and once again we've been lucky enough to bag a pitch just metres from the water with lovely views over to Valentia Island which we will probably visit tomorrow. The two bumps are Valentia! Today we had another spectacular ride over to Valentia Island - and before we set off we did debate how we should get there - we had 3 choices really! As the island sits only about 500 yards in front of where we're parked we could have waited for the tide to go out and then paddled across - but that might have resulted in wet socks which would have been uncomfortable for the rest of the day! We could have nipped across the Maurice O'Neill Memorial Bridge from Portmagee - a bridge that was started in 1967 and opened on New Year's Day in 1971, or we could take the ferry, and as that was only 2 miles down the road that's what we did. 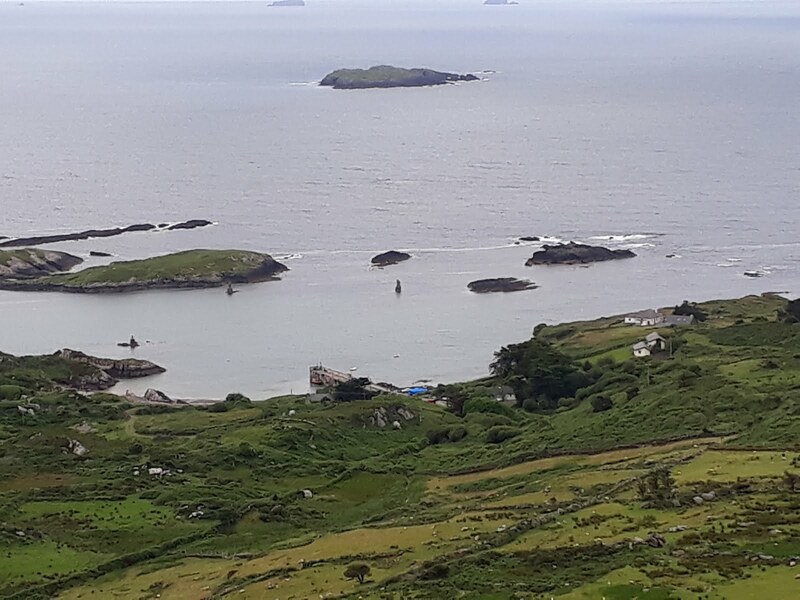 Valentia is one of Ireland's most westerly points, and is positioned on the top side of the Iveragh Peninsula, with dimensions of only 7 miles long and 2 wide - however, a lot is packed into that small space. We crossed over from Cahersiveen to Knightstown, and once there one of the first things we stopped to see was the historic clock tower. It was commissioned in the late 1800s and the 4 faced clock was added a little later, and then apparently it rang out merrily every hour until 1922 when the Free State army decided to take pot shots at it. For a long time after that it didn't work - the info board said 'neither tick, time nor chime to be seen or heard'. And it remained silent for 93 years until it was restored in 2016 when the new chimes started to ring out again! From Knightstown we headed for the lighthouse which sits on a rocky outcrop near Beginish Island - (where in the 10th century there was a Viking Settlement), and although the view was breathtaking it was maybe a bit of a mistake because it made us do something we don't usually have to! The road we were following tipped us down steeply towards the shore - and there we found a lovely spot for our coffee break! But then what comes down has to go back up - and even with the aid of our batteries on full power there was just no way we could propel ourselves up the almost perpendicular hill - so we had to get off and push! Next we headed for the Geokaun Mountain and Fogher cliffs, but on the way John did another thing he hardly ever does - he took a wrong turn which resulted in us riding about half a mile down another steep hill! 'Oh flipping heck' we said before we huffed and puffed our way back up! And then we came to the Mountain itself, and we even had to pay for the privilege of trying to ride up it - we didn't quite make that either! There were 2 stopping points along the road to the summit - the first was a short walkway to see the huge Fogher Cliffs which fall away to the sea from the north side of the mountain. Then once we'd reached the top we were treated to extensive views towards the Dingle Peninsula on the north side, the stately rise of Knocknadobar to the east, the rounded hills of South Kerry inland, and the distant Skelligs to the west - we really didn't know which way to look - but as it was so beautiful we chose it as today's dining room. Our lofty perch also provided views over the remains of the Crookhaven Radio station which was set up in 1902, and a slate quarry which provided slate for the Paris Opera House, London's Houses of Parliament and many billiard tables including the ones made for the Duke of Wellington and for Queen Victoria! While we were up there we also learnt about the first transatlantic cable being laid from Knightstown to Newfoundland in Canada in 1858. This communication link caused great rejoicing but the euphoria was quickly dashed because it failed after only 6 weeks. It then took another 7 years to try laying a new cable - a ship called The Great Eastern sailed from Foilhomurrum Bay in July 1865 and managed to lay 2000 miles of cable across the Atlantic, however, the cable end was lost overboard 600 miles from Canada! The following year the ship tried again on 14th July 1866 with another cable, and not only was that successful, but they also managed to grapple and recover the one that had been lost previously. There were information boards everywhere telling about the history of the islands and how the people suffered great hardship in trying to survive in these remote places but I think my ramblings may become boring if I tried to tell about all we read. Therefore, suffice to say it was all more than interesting especially the stuff about the Skellig islands, and particularly Skellig Michael which is a UNESCO World Heritage Site, and apparently the best preserved early monastic site in the world having been built by St Fionan in the 6th century. The story goes that twelve monks lived on the rock in beehive cells and survived on fish, birds, eggs, milk, meat and vegetables from their garden. However the monks were violently ransacked by vikings between 796 and 839, and additionally the wild Atlantic Storms eventually drove the monks from the rock in the 12th century. We'd love to visit but time is pressing now so I think that pleasure will have to be saved for a future adventure! Eventually, we tore ourselves away, and then it was all mostly downhill all the way home - except of course for the ferry crossing - and it was here that I made John Giggle! I swore and sulked and told him I'd lost my sunglasses somewhere while we'd been out. He just doubled up laughing at me! And then once we were back in T4rdis2 we made the camp site smell like an Indian Take-Away as we cooked our lovely Rogan Josh for Tea! And tomorrow - well that will be a flower day but you'll have to tune in again to hear about that story.